A comet is headed for Mars. 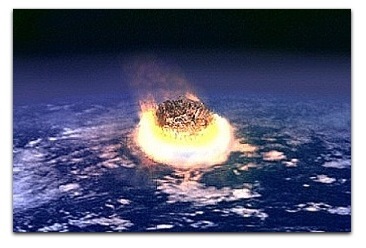 Now approaching at 125,000 miles per hour, it will explode with the force of 35 million megatons of TNT if it hits. That’s a third the size of the collision that caused the Cretaceous-Paleogene extinction event, which famously erased the dinosaurs and ended the Mesozoic, around 66 Million B.C. It also left a 110-mile wide crater next to what is now Mexico. This Mars impact, should it occur, will also be larger than many other impact events that changed life on Earth utterly, causing mass extinctions countless times in in ages before ours. The chance that this comet will hit Mars is one in two thousand. The chance that its tail will graze Mars and produce an impressive sky show there are high. Earth-made probes on the surface of Mars will be watching, if they survive. So expect some impressive news, either way. 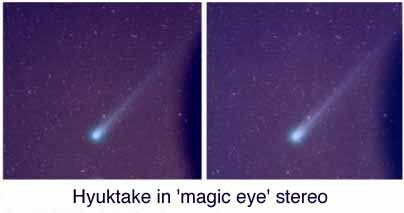 Bonus links: Comet Ison, which might become “the comet of the century” later this year. After looping close to the Sun, it may become as bright as the moon, and visible in daylight. And Comet Panstarrs, which is visible now. “35 million megatons of TNT” that would be an impressive explosion to watch, provided we don’t get hurt from it! I only hope the weather cooperates so the comets of 2013 will be visible.